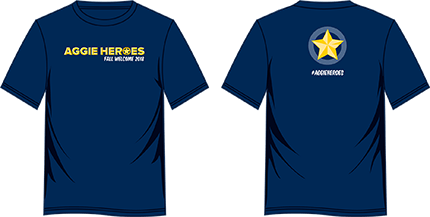 Attendees to the Fall Welcome will receive this T-shirt for free. In person — At the Ticket Office, north end of Aggie Stadium, open 10 a.m.-4 p.m. Monday-Friday. The new Fall Welcome combines Fall Convocation and the New Student Celebration from years past — mixing the formality of the former with the festivity of the latter including a DJ, taiko drumming and dancing, as well as live social media posts projected on a giant screen. Now, as he starts his second year in office, he’s hoping for an even bigger celebration of community at the start of the new academic year, by holding Fall Welcome in The Pavilion at the Activities and Recreation Center (closer to the heart of the main campus and close to student residence halls), merging it with the New Student Celebration, and throwing in free dinner and commemorative “Aggie Heroes” T-shirts for everyone! Staff, faculty and community members must have tickets — see box for information on how to get them (limit two per person). Staff: Release time with supervisor approval is appropriate. Can’t be there? Watch the livestream (or watch the recording later — check back here for the URL).